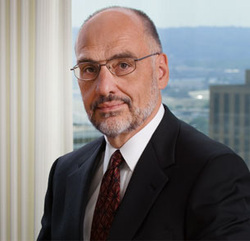 Having been engaged in private legal practice for over 35 years primarily as a transactional attorney, Leo Dehler has developed experience and expertise in a wide range of estate, trust, business, and tax planning. Leo Dehler possesses excellent negotiation and drafting skills. Leo's negotiation and drafting experience includes: commercial lease agreements, option agreements, real estate purchase and sale agreements, business sale and acquisition agreements, patent license agreements, marketing agreements, and other commercial contracts. Leo Dehler was instrumental in the creation of the Catholic Community Foundation, drafting the organizational documents and obtaining public charity and community foundation qualification with the Internal Revenue Service. Additionally, Leo developed and drafted planned giving and endowment policies and documents. Leo Dehler has lectured extensively to professional and community groups on estate and tax planning and non-profit organization.